Gentrification is a touchy subject, as it should be. Gentrification brings together deeply personal issues of home, community, and belonging. Feeling like you belong to a community is part of calling a place ‘home’. Of course, no city has a finished or final state. But when new wealthier residents make a place home, they inevitably drive up rents, displacing families of more modest income to find housing somewhere else. Blame gentrification. The Uptown Apartments, on the far right, opened in 2008 and anchored the revitalization / gentrification of Oakland’s core. The Fox Theater, center, was shuttered in 1966, nearly demolished multiple times, and reopened to much fanfare in 2009. Make Westing, to the left, is among a handful of new, upscale bars that opened in 2011. I blame gentrification, too, even though I am unarguably a part of it. My Census block near Downtown Oakland got wealthier and paler from 2000 to 2010. Sure, having a bar with indoor bocce ball courts is cool, but there’s a kind of guilt that comes with watching a diverse neighborhood turn into such a narrow vision of progress. With the certainty of killing Schrödinger’s cat, if you open a Prohibition-era themed cocktail lounge with artisanal charcuterie, the neighborhood is gentrified. If I helped gentrify Oakland, I can’t even begin to describe what Occupy Oakland has done to it. Some of it has been very positive, like running a People’s Kitchen and reopening Lakeview Elementary School, while some of it has been very negative, like breaking windows and lighting police cars on fire. On May 1, OO organized a small anti-gentrification march. Given the ripe opportunity for political comment, I had high hopes. I was disappointed. 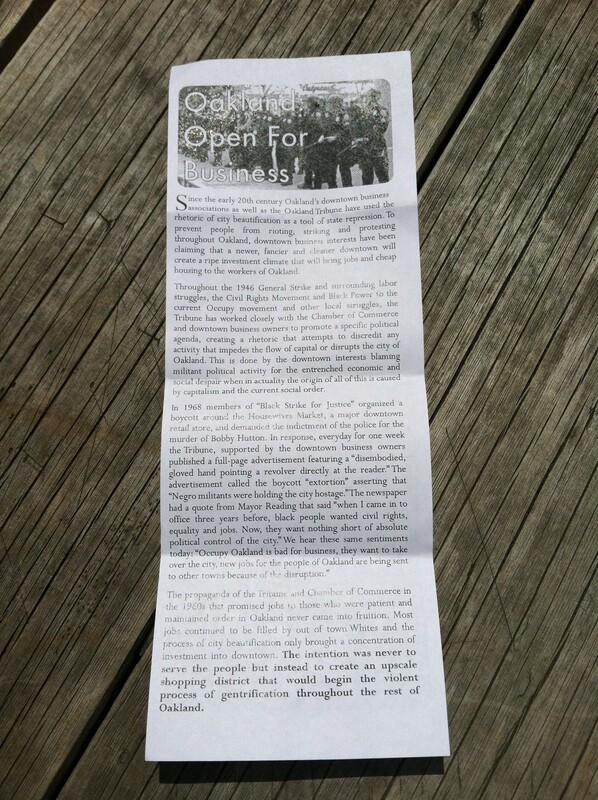 Their pamphlet started off well enough. To someone sympathetic to gentrification and displacement, or even just aware of U.S. history of urban renewal and slum clearance, it raised some uncomfortable questions that I was pleased to see. But rather than focusing on new residents, it goes on to indict small businesses specifically. 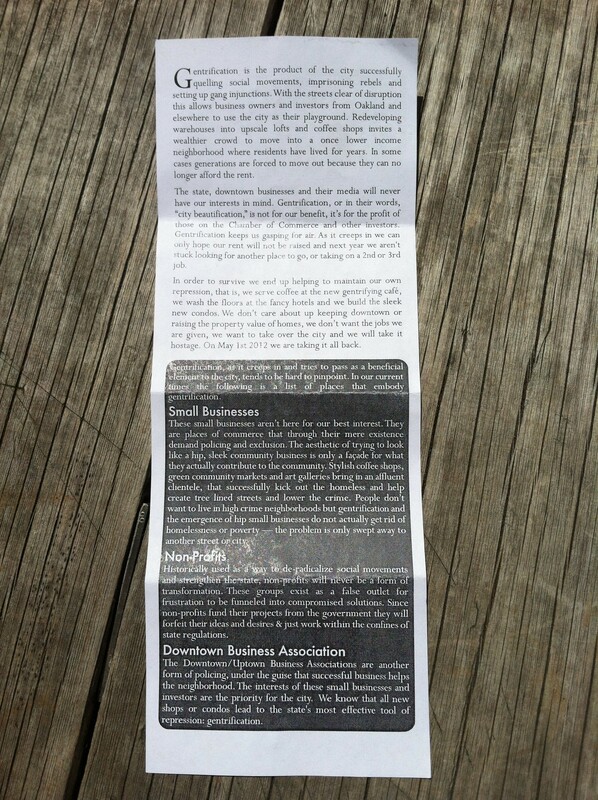 Since the early 20th century Oakland’s downtown business associations as well as the Oakland Tribune have used the rhetoric of city beautification as a tool of state repression. To prevent people from rioting, striking and protesting throughout Oakland, downtown business interests have been claiming that a newer, fancier and cleaner downtown will create a ripe investment climate that will bring jobs and cheap housing to the workers of Oakland. Oh, and as one reporter pointed out, the protestors were almost entirely white and young: “an example of the pot calling the kettle black”. On their brief march, the protesters exclusively targeted businesses. Not just any businesses. Aside from the token Starbucks, they targeted the kinds of businesses that populate gentrified neighborhoods: small, local, and family-owned. They attempted to storm a chocolate shop. Strangely, the protestors walked right past this generation’s most glaring symbol of Oakland’s gentrification. Before California’s current Governor was governor, he was the Mayor of Oakland. As Mayor from 1999 to 2007, Jerry Brown pinned the success of his tenure on the 10K Project – an effort to bring 10,000 new residents to Oakland’s core. Whether or not Brown hit his target depends on how you define Oakland’s core, but Brown’s 1,041-unit Uptown Project coincided with much successful revitalization/gentrification. 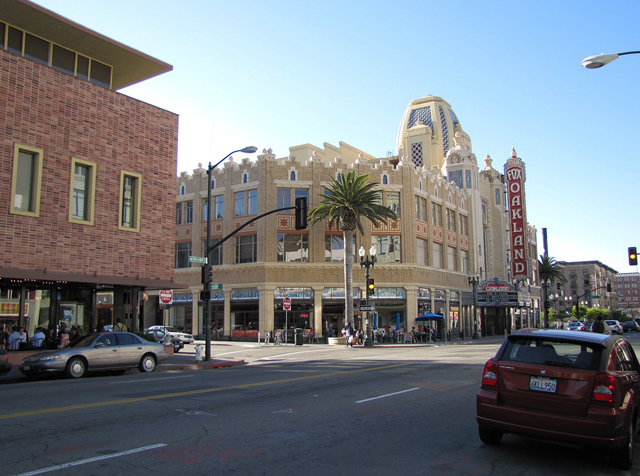 When the New York Times Travel section declared Oakland the fifth top place to visit in 2012, it wrote mostly about bars and restaurants that opened around Brown’s project area. This enormous new residential housing complex seems like the ideal place to protest the real harbingers of gentrification. Though the development sits within five minutes of a major BART station, every apartment is bundled to an indoor parking space. Its imposing and cold superblocks disrupt the street grid, and its exterior streets are unwelcoming to anyone approaching from the outside. The whole thing surrounds an empty fenced lot, which is reserved for future parking. Many households were relocated to build it, and many of its current occupants are relatively new Oakland residents. But protesting residents is somehow much harder to stomach than protesting businesses. It’s easier to shake your first at Starbucks than ask if you, your neighbors, or your friends are displacing the very community you chose to join. We make exceptions for the individuals in the gentry we personally know. Going home again isn’t an option on this side, either. Nona Willis Aronowitz discusses the difficulty of living near her now-gentrified childhood home of Greenwich Village without contributing to the ongoing gentrification of Harlem in an Atlantic Cities post: “How the Recession Made me a Gentrifier in the Home Town”. Living across the Bay from San Francisco, I definitely run into my fair share of “I didn’t have a choice, the rents are just so crazy over there”. What about a complete transplant like me? I grew up in a small town, so no city owes me anything. I arrived on spec, carpet bagging for a chance to join the creative class. Many people had little choice but to relocate. How many young people leave small towns because they just can’t find a relevant job (or any job)? The web developer from Vermont, the LEED architect from rural Ohio, or the bike mechanic from western Maryland – these people were forced by economic pressure to switch communities, too. The difference is that the gentrifiers are gaining access to jobs, walkable neighborhoods, and opportunities, while the displaced are not. Gentrification and displacement won’t be solved until we can ensure a parity of opportunity – that kids growing up in Oakland, Greenwich Village, Harlem, and rural Vermont all have equal opportunities to afford to live where they want and hold the jobs that they want. Until then, it’s refreshing to know I’m not the only one grappling with my role in displacement. I know I’m lucky to be on the side enjoying the bocce ball and occasional $10 cocktail. Post and photos by Ruth Miller. Thanks for commenting, Mark. Investment is definitely cheaper, but neither is executed perfectly (at least over here). An interesting post. I grew up in Metro Detroit, an area that has been disgustingly plagued with white flight for the past 60 plus years (read: http://www.nytimes.com/2011/03/27/opinion/27Sugrue.html?_r=1). White flight is of course the flip opposite of gentrification: where whites migrate out of the area when minority families move in. Most of my childhood I was the sole Catholic in a predominantly Jewish suburb. As black and Arabic families began to move into the neighborhood, nearly every white friend that I had moved one suburb over, a convenient mile away. Because of this experience, I sometimes feel as though I cannot fully grasp the concept of gentrification. White flight is residential segregation, as gentrification seems to be as well. But on paper what happens is that the whites take their whiteness, which around Detroit used to equate to increased property values (not so much with the recession) and their new city gets a major boost in its tax base. I recall learning that the boost results in more support from the state as well. Right here is the root of the injustice: overtime the now black suburb will receive from the state X-fold LESS per child in the public school system than the white suburb . I suspect that gentrification and white flight would matter less if the resources (funding for schools, recreation, et cetera…) remained the same across all neighborhoods.